Everyone recognizes lady beetles, or ladybugs, and welcomes them into their gardens. Unfortunately, baby lady beetles look nothing like they do as adults. 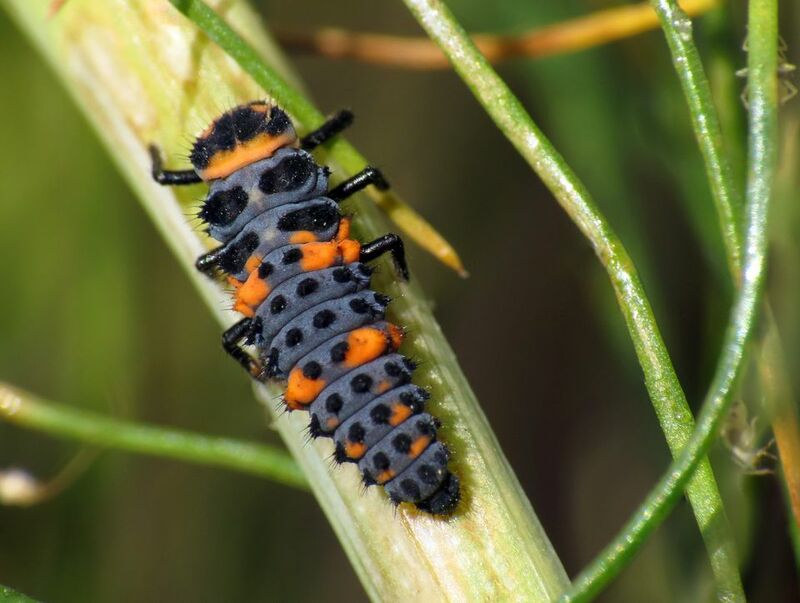 Instead of bright red shells and black dots, ladybug larvae resemble tiny black alligators and do not look like something you want crawling around your plants. Take a good look, because the last thing you want to do is kill these garden allies before they reach maturity. What Does a Lady Beetle Nymph Look Like? The ladybug nymph is about ½ inch in length, with an elongated, spiny body. It is black with red, orange or white markings. Their appearance can be quite alarming, but they won't harm either you or your plants. They will spend several weeks eating pest insects until they eventually pupate and emerge and adults. Lady beetles overwinter as adults in dry, protected areas such as tree bark, house shingles or even indoors in attics. They come out from cover in early spring and begin feeding and laying eggs right away. One female lady beetle can lay up to 1,000 eggs over a three-month period. When the young lady beetles emerge from the eggs as larvae, they look like the picture shown and begin feeding immediately. What Insects Do Lady Beetles Eat? Before you say yuck, consider that one nymph will eat about 400 aphids in the three weeks before it pupates. According to Ohio State University Extension, an adult lady beetle will eat more than 5,000 aphids in its lifetime. While ladybugs' favorite food seems to be aphids, they also will prey on soft scale, whitefly pupa, thrips, and spider mites if no aphids are available. Besides other insects, lady beetles also feed on pollen. Plant some of their favorite flowers, to attract them to your garden. These include Angelica, calendula, chives, Coreopsis, cosmos, dill, marigold, sweet alyssum, and yarrow. Lady beetles will also need a source of water. If you have a water garden or fountain, great, but a shallow saucer of water is plenty. Make sure you change the water often, or you will attract mosquitoes looking for a place to lay their eggs. Some species of lady beetles have produced several generations in a year, while others will produce only one. If your garden does not offer a lot of insects for them to feed on, they will fly off in search of better feeding grounds. Since the larvae cannot yet fly, they will stick around and feed on what they can, until they pupate. To keep them all there as long as possible, do not use insecticides. Besides killing off the lady beetles directly, if you kill their food source, there is no reason for them to stay. Instead, get used to having a balance of "good" and "bad" insects in your garden. As long as things are staying in check, you can all peacefully coexist. So don’t panic when you see these prehistoric looking creatures on your plants. The ugly baby ladybug is definitely one of the good bugs.